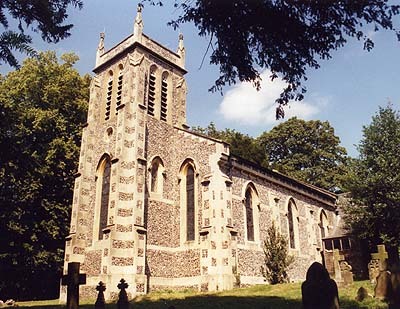 The original church at Sulham dated from the 13th century, but it was rebuilt in 1836-8 (with extensions of 1875) by Rev. John Wilder, Vice-Provost of Eton College, who lived in the adjoining Sulham House and fancied himself as a bit of an architect. He is said to have been inspired by his 'grand tour' of Italy undertaken in his younger days, although one can also identify influences from local churches, such as Tidmarsh and Theale. New Pevsner calls it, "an almost completely unspoilt example of a pre-Camdenian village church in the Early English style". It originally had a tall spire, but this was removed in 1959. Inside, it retains a 1733 font and Tudor-Gothic pulpit from the previous building.